Does winning the Fields medal decrease subsequent research achievement? I just stumbled on this summary in Slate of a study by Borjas and Doran (2012, FULL TEXT PDF). According to a new study by Harvard's George Borjas and Notre Dame's Kirk Doran of recipients of the Fields Medal, the most prestigious prize in mathematics, winning big actually kills productivity. I have not yet read the paper. But my first thought would be that a lot would depend on how you define contenders. I also imagine that the criterion of interest is research achievement, and that number of papers is an imperfect index of this. 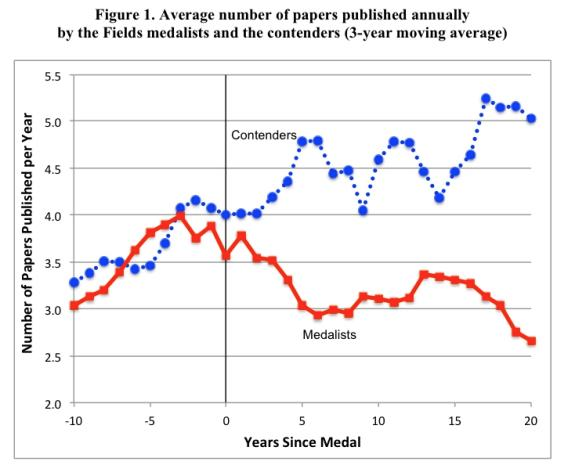 Does winning the Fields medal actually decrease the research productivity of winners below what it would have been had they not won the medal? How strong is the evidence presented by Borjas and Doran (2012)? What, if any, limitations does the study have? Browse other questions tagged motivation performance io-psychology or ask your own question. What is the effect of merely expecting an interruption on performance? Does personality imply an inclination to be an expert in one field or average in “all” fields? Does military background enhance personal productivity?